The story of Esther reads like a novel and is full of great spiritual lessons. The greatest being that God protects His people. He may not always do it in the way we think He should, but the book of Esther shows that He is in control even when we don’t see Him. In fact, God is not directly mentioned by name in the book of Esther. Here is the story of Esther through a summary of each of the 10 chapters. King Ahasuerus threw a grand party but his wife, Queen Vashti, refused to attend. As a result, she was banned from the presence of the king and the search for a new queen began. Historically this took place around 479 BC. King Ahasuerus is also known as Xerxes I of Persia who ruled 485-465 BC. A young lady in the kingdom, Esther, was compelled to participate in a contest to choose a new queen. Her uncle (or possibly cousin) took her in as his own daughter when Esther’s parents died. Uncle Mordecai was a Jew who was taken from Israel during the Babylonian captivity. 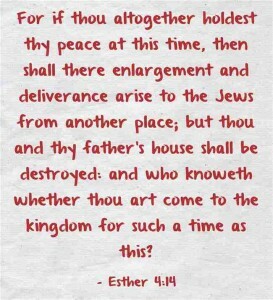 However, it was not known to the Persian leaders that Esther was also a Jew. Esther entered the king’s harem because all the beautiful young virgins were gathered in for the search for a new queen. She was chosen to become the successor to Vashti. An interesting, and seemingly insignificant story appears in the last few verses of chapter 2. Mordecai learned of a plot to harm the king. He informed the new queen who then passed the news along to the authorities. The men involved in the plot were hanged. This becomes important in the middle of the story. One of the chief servants of King Ahasuerus was Haman. He was a proud man who demanded obedience and worship from those under him. However, Mordecai refused to bow to Haman. This infuriated Haman. Knowing that Mordecai was a Jew, Haman sought to destroy all the Jews in the kingdom. He convinced the king to pass a law for genocide of the Jewish race. Neither Haman nor the king suspected that the new law would affect Queen Esther. Mordecai and the Jews began to mourn and fast. They knew their time was limited. Mordecai mourned in sackcloth and ashes. He refused to accept the clothing that Queen Esther sent to him. However, she had apparently been shielded from the news of the coming destruction. When she sent a servant to find out from Mordecai what the trouble was, he returned with the news of the decree. Mordecai asked that Esther go into the presence of the king to plead for the Hebrew nation. Esther told him that she could not speak with the king without an appointment. An attempt to do so could result in death. The king had not called Esther into his presence in the previous month. Mordecai said that Esther would not escape from the death sentence even though she was queen. He proposed that Esther may have been chosen as queen for such a time as this to be a champion for her people. Esther worked up enough courage to approach the king. Ahasuerus accepted her into his presence and asked what her request was. She invited both the king and Haman to her house for a meal and she would tell her request at that time. When the two guests arrived Esther invited them for a meal once again the next day. Haman swelled with pride at the thought of being invited twice to Queen Esther’s house. However, between the two occasions Haman met Mordecai in the streets. Mordecai still refused to bow before Haman. This enraged wicked Haman and he did not want to wait for the decree to eliminate Mordecai. He ordered a special gallows to be built so that he could have Mordecai hanged the next day. King Ahasuerus could not sleep that night—possibly because someone was building a gallows in town. The king requested that someone read to him the recent events from the kingdom. The story of how Mordecai stopped the plot against the king (from chapter 2) was read to him. Ahasuerus realized that he had never publicly thanked Mordecai for the work he did to protect the king. That same night Haman came to visit the king to get his blessing on Haman’s plans to hang Mordecai the next day. Before Haman could tell why he was at the king’s house so late, King Ahasuerus asked Haman what the king should do for a man that he wanted to honor. Thinking that the king wanted to honor him, Haman thought up an elaborate parade which included the honoree riding the king’s horse through town while wearing the king’s robe and crown. Imagine Haman’s surprise when the king said that Haman should make all the arrangements to honor Mordecai in the way Haman proposed. Haman was mortified and furious as he led Mordecai through the streets. But he could not stay angry very long before it was time to return to Queen Esther’s house for the banquet. King Ahasuerus and Haman returned to Esther’s house for the meal. The king again asked Esther what her request was. He even offered up to half the kingdom to Esther if she so chose. Ahasuerus stepped out of the house to contain his rage. Haman feared for his life. He went to Esther to beg for her mercy. When the king returned Haman was on Esther’s bed begging. This infuriated the king even more and he ordered men to carry out Haman immediately to be hung on the gallows he had prepared for Mordecai. 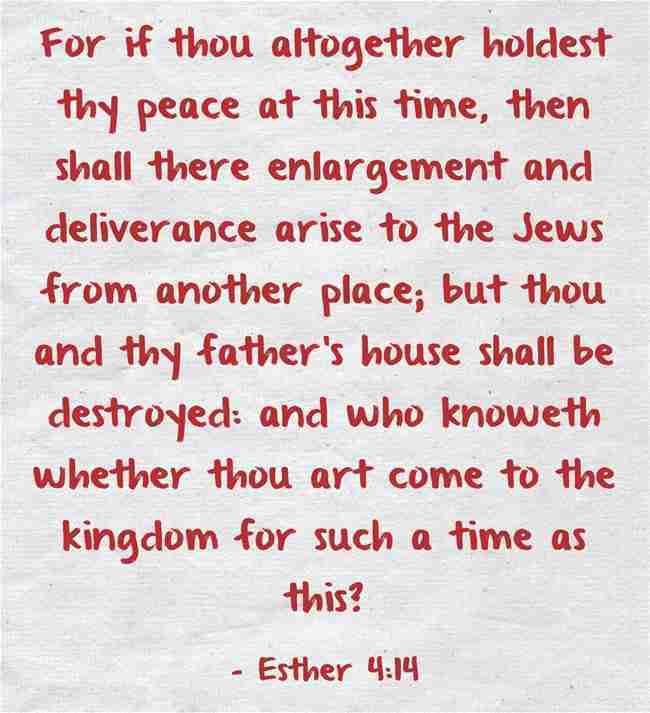 Queen Esther was given rule over the house of Haman. Mordecai was revealed to be the foster father of Esther. King Ahasuerus gave his ring to Mordecai—the ring he had previously given to Haman when Haman became the king’s right-hand man. Esther asked the king to allow the Jews to defend themselves against the people of Haman, the Agagites. As Haman’s messengers previously went out to declare the destruction of the Jews, now Ahasuerus sent messengers telling that all who rose up against the Jews would be destroyed. More than 75,000 enemies of the Jews were killed in two days throughout the kingdom. Even with all this destruction the king asked Esther what more could be done to avenge her and her people. Her only request was that Haman’s ten sons (who had already been killed) be publicly hanged on the gallows. At the end of those horrible days of bloodshed and victory, the Jews began to celebrate. They celebrated by giving gifts to one another and helping the poor. This time of celebration is called Purim and is still celebrated by the Jews each year. Purim, one of the two non-levitical feasts of the Jews, is named after the manner in which Haman decided on the day he would destroy the Jews. He cast lots, pur, to determine the day of destruction. It was determined by the king and written in the records that Mordecai was a great man among the Jews and the Persians. Mordecai was second only to the king within the kingdom of Ahasuerus. As mentioned, Purim is one of two non-levitical feasts. The other is Hanukkah. These are feasts (or celebrations) that were not found in the Law of Moses, yet are celebrated by the Jews throughout history. The month Adar roughly falls within February and March (on the Gregorian calendar) each year. Today Purim is celebrated by a reading of the book of Esther once or twice during the celebration. Each time Haman’s name is read everyone stomps, boos and hisses in an attempt to disgrace the name of the enemy of the Jews. Gifts of food and money are given during the feast.